How can one provide a reasonably sized overview of a field as large, diverse, and continually expanding as serial killer fiction? By reminding ourselves that fiction about serial murder shares several features with serial killer non-fiction: its history goes back a lot further than one might think; the lines between fiction and non-fiction often blur in examples of this genre; it owes a considerable debt to law enforcement discourses about serial murder; and examples of it can be found on both sides of the high/low culture divide. Although the term “serial murder” does not come into being until the 1960s, and is not popularized by the F.B.I. until the 1970s, fictional texts depicting something akin to what we now call serial murder have a much longer history. Thanks partly to the debt many serial killer narratives have to the Gothic literary tradition multiple murder is quite a common feature of Gothic-influenced early American literature. As Philip Simpson explains in one of the most useful analyses of fictional texts about serial killers, Psycho Paths: Tracking the Serial Killer Through Contemporary American Film and Fiction (2000), such novels as Ormond (1799), Nick of the Woods (1835),The Partisan (1835), and The Quaker City: or, The Monks of Monk Hall (1845), all “present multiple body counts and Shadow villains in which one can see the literary prototypes of the contemporary American serial murderer” (31). While I would not disagree with Simpson’s observation, I think it more helpful to look to a later period for the true origins of serial killer fiction. Just as non-fictional serial killer texts often take their inspiration from the notorious crimes of the day, so too do their fictional counterparts. Not surprisingly, therefore, we find a significant number of fictional texts around the first, and in some ways still the most, notorious case of serial murder: the Jack the Ripper murders of 1888. Revealingly, when we consider the current iconic status of the serial killer in American culture, most of these fictional texts were dime novels published in the United States, thus testifying to the intense American fascination with the Whitechapel murders. In some respects, dime novels share an important commonality with the huge number of contemporaneous press reports about the Ripper because, as Michael Denning has argued, “[m]any dime novelists were newspaper reporters and editors. Moreover…dime novel plots were often constructed out of the events reported in the daily and weekly newspapers of cities around the country” (24). The dime novels based on Jack the Ripper illustrate Denning’s point and indicate that their authors drew inspiration from international as well as American crimes. In other respects, however, these fictional accounts need to be placed in a separate category from newspaper reports, because they had the freedom, denied to the press, to offer imaginative solutions to the Ripper murders that reveal a great deal about what was at stake, ideologically speaking, in assigning responsibility for the Whitechapel killings. The dime novel entitled The Whitechapel Murders: Or, on the Track of the Fiend , for example, written by “Detective Warren” and published as part of the Cap Collier Library in December, 1888, is almost monomaniacally insistent in its criticisms of the British police, who are invariably portrayed as bumbling fools. The detective hero in this case, with the impeccably American name of Clint West, joins forces with a French detective, Jules Henri (a move surely calculated to upset a British audience!) in their search for the Ripper, who they believe is a mad Russian. Ironically, although West and Henri are utterly contemptuous of the efforts of the British to capture the Ripper, the generic peculiarities of the dime novel require that they fail again and again to capture the Ripper themselves, despite having numerous chances to do so. W.B. Lawson’s dime novel, published as an entry in the Log Cabin Library and entitledJack the Ripper in New York; or, Piping A Terrible Mystery, takes its inspiration from the real-life murder of Carrie Brown in Manhattan in 1891, an event that led to speculation at the time that Jack the Ripper had moved to the United States. Set in a district of the city that Lawson describes as “the Whitechapel of New York” (2) this novel, like that of “Detective Warren,” berates the London police, praises the American police and, like the New York City police themselves in the Carrie Brown case, pins the crime on a foreigner, an Algerian named ‘Frenchy.’ There is something predictable about these fictional denials of the possibility that Jack the Ripper might be an American, and the related construction of a conveniently foreign Ripper, but an interesting variation on this theme comes in the form of A.F. Pinkerton’s detective novel, The Whitechapel Murders; Or, An American Detective in London, published by the Chicago firm of Laird & Lee in November, 1888. The main reason the Whitechapel case still resonates in the popular cultural memory, of course, is the continuing mystery of Jack the Ripper’s identity, and this mystery is exactly what makes him such an appealing protagonist for serial killer fiction, so much so that these nineteenth-century dime novels constitute a kind of template for the serial killer fiction which comes later. Although the fact that the Ripper was still at large was undoubtedly disturbing to late nineteenth-century audiences, authors were able to address that sense of unease by organizing their fictional narratives around law enforcement figures of one kind or another, a feature that still distinguishes many examples of serial killer fiction to this day. The continued mystery surrounding the Ripper, however, also had its advantages; it allowed both authors and readers maximum latitude in imagining what kind of person Jack was, what he looked like, and the solution to his real identity. As the dime novels suggest, and as many contemporary serial killer narratives confirm, one possible solution to the mystery was to accentuate the serial killer’s outlandishness and difference from the norm, either by making him conspicuously foreign, or by giving him flagrantly perverted or unusual compulsions. Another alternative, however, was to accentuate the serial killer’s ordinariness, and this is what we see in the next significant example of serial killer fiction, Marie Belloc Lowndes’ 1913 novel, The Lodger. Inspired by a dinner party conversation with a woman who was convinced Jack the Ripper had boarded in that woman’s house, Lowndes’ Mr. Sleuth, the character who may or may not be the Ripper, remains a shadowy figure, normal almost to the point of total anonymity. The most important legacy of the Jack the Ripper dime novels and of Lowndes’ book for later serial killer fiction, however, is the way these early examples of the genre are inspired by real cases. If many non-fictional texts about serial murder (especially in the true crime genre) blur the line between non-fiction and fiction by using novelistic techniques, many fictional texts achieve the same blurring by a different means and give their treatments of serial murder a certain authority or objectivity by drawing in a more or less obvious fashion on the details of actual incidents of serial murder. A good example of this trend is a landmark text by a key modern mythographer of serial murder, Robert Bloch’s Psycho. Working in the publishing ghetto of pulp paperback originals and in a year (1953) when Thompson produced a total of six novels (! ), Killer is a groundbreaking first-person account of how a serial murderer thinks, with all of that killer’s contradictions, self-justifications, and the blackest of black humor. Best of all, the killer is the local sheriff, indicating just how axiomatic the belief that “power corrupts” is in Thompson’s fictional world.The author of one of the most influential texts inspired by the Whitechapel murders, the short story “Yours Truly, Jack the Ripper,” the prolific Bloch’s most famous work is undoubtedly Psycho, supposedly inspired by Bloch’s research into the crimes of the Wisconsin serial killer Ed Gein. How much of Gein’s case actually makes it into Psycho is debatable and ultimately unimportant; what matters is that the novel’s connection with Gein gives it an air of legitimacy and authority and has thus undoubtedly helped to cement the book’s reputation as the ultimate fictional look inside a killer’s mind. Personally, I would give that honor to Jim Thompson’s The Killer Inside Me , a true classic of serial killer fiction. Although serial killer fiction therefore has a venerable history, it would be perverse to deny the fact that the popularity of the genre explodes in the 1970s and beyond. The reason for the rapid growth of fiction about serial killers during this period is the F.B.I.’s success in both building up a full-scale moral panic around serial murder, and establishing the Bureau as the solution to the ‘epidemic’ of marauding serial killers plaguing the land. Just as its hunting down of gangsters in the 1930s produced the image of the F.B.I. agent as the “G-Man,” so the Bureau’s profiling of serial killers in the 1970s and 1980s produced an analogous image: the F.B.I. agent as “mind-hunter,” “uniquely qualified to deal with the serial murder menace” (Jenkins 70). At first glance, Thomas Harris’ novels, easily the most popular and influential examples of serial killer fiction ever written, appear to owe their success to their fetishization of the F.B.I. mind-hunter image. The reality, however, is more complicated. Rather than satisfying itself wholly with the law enforcement perspective on serial murder, Harris’ work avoids the extremes of either attacking the F.B.I. or viewing them completely uncritically. This is one reason why his work has made such a strong impression on readers of serial killer fiction. Philip Jenkins has discussed the significance of Harris’ work for popularizing not only the mind-hunter image of the Bureau’s Behavioral Science Unit, but also the investigative techniques and methods of the F.B.I. more generally “thus providing the F.B.I.’s violent crime experts with invaluable publicity and unprecedented visibility” (73). Although there is a lot of truth to what Jenkins says, there is a degree of irony in the fact that Harris’ work gave such a boost to the F.B.I.’s authority over serial murder when we consider the fact that Harris’ most famous book, The Silence of the Lambs, contains a major implied criticism of the Bureau (and thus, also by implication, of its definition of and approach to serial murder). Although for much of Silence, the resources and investigative techniques of the F.B.I. are seen in an unproblematically positive light, a major exception to this emphasis comes at the point when the Bureau receives an address for the man they suspect is Buffalo Bill, Jame Gumb. The F.B.I. immediately heads off to the address in a plane bristling with high-tech weapons and gadgetry, while Clarice Starling, seemingly left out of the hunt, is out in the field tracking down leads. However, it is in fact Clarice who eventually finds and kills Buffalo Bill, whereas the official face of the F.B.I., despite all its sophisticated resources and technology, goes to the wrong address, and only arrives at the right address when it is all over. What we see here is an exception to the praise and admiration serial killer fiction generally lavishes on the F.B.I. and its ability to fight serial murder. There is apparently a part of Harris that wants to leave space for the valorization of individual pluck and initiative, for the working out of the intuitive hunch that often cannot be accommodated within the bureaucratic structure of an organization like the F.B.I. In this respect, although Harris’ most recent novel, Hannibal, received much (frequently well deserved) criticism, it represents a distinct advance over Harris’ earlier work in that it contains an even more jaundiced picture of a corrupt and ineffective F.B.I. But the immensity of Harris’ success cannot be explained solely by his complex relationship to law enforcement discourses on serial murder. Philip Simpson has described how serial killer fiction interweaves “at least four general structural or thematic patterns: the neo-Gothic, the detective procedural, the “psycho” profile, or the mytho-apocalyptic” (25). Leaving aside the mytho-apocalyptic, which I do not believe is particularly relevant to Harris’ work, I think a large part of Harris’ success, and the success of those fiction writers who have come after him and have clearly been influenced by him, depends upon how skillfully they combine these different patterns. In particular, I would argue that Harris’ most fundamental contribution to the genre is the way he is able to combine the detective procedural and the “psycho” profile in order to both indulge his reader’s fascination with the serial killer and simultaneously give that reader a way to either disavow that fascination altogether or contain it by identifying with a law enforcement protagonist or organization. Indeed, this dialectic between indulgence and disavowal may be the key to the success of serial killer popular culture as a whole. By presenting and then killing off Red Dragon, Buffalo Bill, and Mason Verger, and/or by encouraging us to identify with the F.B.I. or Clarice Starling, Harris allows us to maintain our uncomfortably and exhilaratingly complex relationship with Hannibal Lecter. In so doing, Harris is able to maintain the most enduringly serial feature of serial killer fiction – the sequel. Harris manages the balancing act that maintains readerly pleasure better than anyone else in the genre; that’s why he is so successful. Others working in the field do so with varying degrees of success, but also in a way that inevitably reveals how the elements that make up serial killer fiction can easily become a codified formula. Patricia Cornwell, for example, beginning in Postmortem, gives us supernaturalized serial killers such as Temple Gault to be fascinated by, but then balances that fascination with the safely technical and heroically plucky medical officer Kay Scarpetta. Writers such as James Patterson (Kiss the Girls), Jeffery Deaver (The Bone Collector), Michael Connelly (The Concrete Blonde), and many others all have their variations on the formula, but that does not make them, in many cases, anything more than formulaic, and this fact leads one to speculate whether serial killer fiction has any future, or whether the market is oversaturated to the point of exhaustion. When we consider the future of serial killer fiction there are cautious reasons for optimism, partly because the past of the genre indicates how enormously flexible the figure of the serial killer is in the hands of writers. For example, although the vast majority of popular fictional appropriations of the serial killer have drawn on the thriller, suspense, and horror genres, there are also examples of serial killers in classical detective fiction both old and new. Admittedly, the serial killers in such novels as Agatha Christie’s The ABC Murders and P.D. James’ Devices and Desires are not really convincing (for reasons I explain elsewhere – see Schmid 2000), but their mere presence testifies to the serial killer’s adaptability and this alone should ensure the figure’s survival in the future. The same point can be made in a different way by noting the presence of serial killers in many examples of ‘high’ as well as ‘low’ literary culture. Although we are used to thinking of serial killers as a staple feature of disposable genre fiction, we also need to remind ourselves that Bret Easton Ellis notoriously draws on the serial killer as a symptom of the ills of postmodernity in both American Psycho and Glamorama, while ‘outlaw’ queer novelists such as Dennis Cooper (in a quintet of novels beginning with Closer in 1989) and Poppy Z. Brite (in Exquisite Corpse) use serial killers to dramatize the violence and powerplays inherent in sexual and interpersonal relations. Most interestingly, in Zombie, Joyce Carol Oates uses a thinly-fictionalized version of Jeffrey Dahmer to substantially revise the popular account of what motivates serial killers, thus also revising conventional explanations of why we are fascinated by them and making it much more difficult for us to disavow our sometimes pernicious role in maintaining the celebrity culture that has grown up around serial killers. With such a variety and depth of serial killer fiction available to us, it seems unlikely that the serial killer will disappear any time soon, if ever. 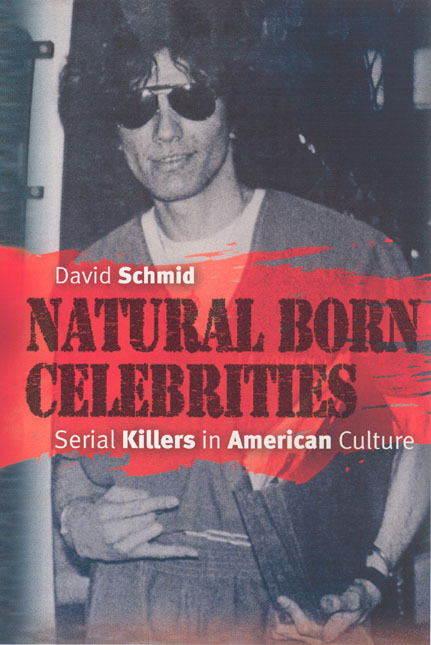 NOTE: In writing this article, I have drawn from various sections of my book, Natural Born Celebrities: Serial Killers in American Culture (Chicago 2005). I am grateful to the University of Chicago Press for their permission to reprint. Bloch, Robert. Psycho. New York: Simon & Schuster, 1959. —. Yours Truly, Jack the Ripper: Tales of Horror. New York: Belmont-Tower, 1962. Brite, Poppy Z. Exquisite Corpse. New York: Simon & Schuster, 1996. Christie, Agatha. The ABC Murders. New York: Pocket Books, 1963. Connelly, Michael. The Concrete Blonde. Boston: Little, Brown, 1994.
Cooper, Dennis. Closer. New York: Grove Press, 1989. Cornwell, Patricia. Postmortem . New York: Pocket, 1998. Deaver, Jeffery. The Bone Collector. NY: Viking Penguin, 1997. Denning, Michael. Mechanic Accents: Dime Novels and Working-Class Culture in America. New York: Verso, 1987. Ellis, Bret Easton. American Psycho. New York: Vintage, 1991. —. Glamorama. New York: Knopf, 1998. Harris, Thomas. Hannibal. New York: Delacorte Press, 1999. —. Red Dragon. New York: Dell, 1981. —. The Silence of the Lambs. New York: St. Martin’s Press, 1988. James, P.D. Devices and Desires. New York: Warner Books, 1989. Lawson, W.B. Jack the Ripper in New York; or, Piping a Terrible Mystery. New York: Street & Smith, 1891. Lowndes, Marie Belloc. The Lodger. London: Methuen, 1913. Oates, Joyce Carol. Zombie. New York: Dutton Books, 1995.Patterson, James. Kiss The Girls. New York: Warner, 1995. Pinkerton, A. F. The Whitechapel Murders; Or, An American Detective in London. Chicago: Laird & Lee, 1888. Schmid, David. “The Locus of Disruption: Serial Murder and Generic Convention in Detective Fiction.”The Art of Detective Fiction. Ed. Warren Chernaik. London: Macmillan 2000. 75-89. —. Natural Born Celebrities: Serial Killers in American Culture. Chicago: U of Chicago P, 2005. Simpson, Philip L. Psycho Paths: Tracking the Serial Killer Through Contemporary American Film and Fiction. Carbondale and Edwardsville: Southern Illinois UP, 2000.Thompson, Jim. The Killer Inside Me. New York: Vintage, 1991. Warren, Detective. The Whitechapel Murders: Or, On the Track of the Fiend. New York: Munro’s Publishing House, 1888.